It seems as though diesel, groceries, fertilizer, grain and hay are all on the price escalator going up, up, up. There are a number of reasons for this run in prices, including pressure on crops from ethanol production, poor climate conditions in some areas and the declining value of the dollar. Of course none of these reasons lessen the impact on our pocketbooks, and horse owners are feeling the financial strain. This has caused many horse owners to become more focused on getting the most value for their dollar when it comes to feeding their horses. Finding the best-value horse feed means looking past price per bag and calculating the actual cost per day to feed. Divide the price per bag by 50 lbs. to determine price per pound. Then, multiply the price per pound by the pounds fed per day. 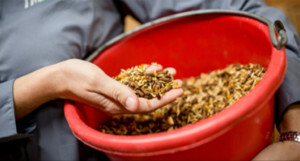 Horse owners are often surprised to find the feed that is cheaper by the bag may be more expensive per day, because it must be fed at a larger amount per day or requires added expensive supplements to meet nutrient requirements. Not only does Strategy® Professional Formula GX horse feed cost less per day to feed, the horse feed nutrition also contains the proper balance of protein, vitamins and minerals the horse needs, whereas oats must be supplemented to provide all the nutritional needs of the horse. If you feed a daily protein, vitamin and mineral supplement, you want to figure the cost and add that to your grain cost. Basic supplements will usually add $0.50 to $1.00 per day more to the cost of feeding your horse. In many areas of the country, hay prices have gone up faster than grain prices. Forage quality and weight per bale both factor into finding the best value for hay. Quality is impacted by variety of forage, the maturity of the plant at time of harvest and the conditions at harvest. The assumption that alfalfa is better quality than grass and therefore justifies a higher price isn’t always the case. Moderate-quality alfalfa, 16 percent or less protein, actually may be a lower feed value than good-quality grass, 11 percent or more protein. The moderate-quality alfalfa is usually very mature and lower in digestibility, whereas the higher-quality grass hay is more digestible and palatable to the horse. Most people are not very accurate when estimating amounts of hay and grain being fed. For example, a 3-pound coffee can holds 3 pounds of coffee, but it will hold 4 pounds of Purina® Strategy® Professional Formula GX horse feed. The weight of oats can vary quite a bit depending on the quality of the oats, ranging from 2.5 to 4.25 pounds per 3-pound coffee can. Hay weight can vary quite a bit as well so, when possible, hay should be purchased by the ton instead of by the bale. Hay that costs $10 per bale and weighs 65 pounds per bale is a better value than hay that costs $8 per bale but weighs only 45 pounds per bale. If you are feeding 20 pounds of hay per day, the hay that costs $10 per bale calculates out to $3.08 per day, while 20 pounds from the $8 bale of hay ends up costing $3.54 per day. Also, two flakes from the heavier bale will often weigh more than two flakes from the lighter bale, so your actual feeding rates may vary as well. Weighing a few representative flakes from hay when you first buy it can help keep your feeding rates more consistent and your hay costs more under control. The cost of owning horses has certainly gone up over the last few years, and there doesn’t appear to be a change in that trend in the forecast. However, using a scale and a calculator to do a little figuring can reveal possible ways to save money without compromising the health and well being of your horses. This entry was posted on Monday, August 8th, 2016 at 2:11 pm	and is filed under Horse, News & Updates. You can follow any responses to this entry through the RSS 2.0 feed. Both comments and pings are currently closed.